Schools were closed in New York as well as in parts of Connecticut, Massachusetts, Rhode Island and Virginia. NEW YORK: Winter Storm Stella unleashed its fury on much of the northeastern United States on Tuesday, dropping snow and sleet across the region and leading to school closures and thousands of flight cancellations. Stella, the most powerful winter storm of the season, was forecast to dump up to two feet (60 centimeters) of snow in New York and whip the area with combined with winds of up to 60 miles per hour (95 kilometers per hour), causing treacherous whiteout conditions. The National Weather Service (NWS) said winter storm warnings were in effect from eastern West Virginia to Maine, "and blizzard warnings from eastern Pennsylvania to southwest Maine," an area that includes New York City. "Snowfall amounts in excess of a foot are likely inland along with strong and gusty winds. High winds and tidal flooding are going to be an issue for coastal areas north of the Outer Banks," off the coast of North Carolina, the agency said. More than 6,800 flights were cancelled for Monday and Tuesday, with airports in New York, Boston, Baltimore, Washington and Philadelphia hit hardest, according to the tracking service FlightAware. In Connecticut, the governor announced a statewide travel ban, telling residents across the affected regions to stay off the roads. The storm also led to the postponement of the first meeting between President Donald Trump and German Chancellor Angela Merkel in Washington until Friday. In New York, the UN headquarters announced it would close, a disruption for the thousands of delegates expected to attend a women's conference. In the financial markets, many on Wall Street were expected to work from home with low trade volume anticipated, in part as investors waited for Wednesday's decision from the Federal Reserve on whether to raise interest rates. Sleet and ice covered the streets of the Washington area, where the National Park Service warned that the cold could wipe out up to 90 percent of the capital's beloved cherry blossoms. One popular meme on social media was a clip of the actor Marlon Brando and his famous cry of "Stella!" from the steamy 1951 film "A Streetcar Named Desire." In New York City, home to 8.4 million people, Mayor Bill de Blasio declared a state of emergency starting midnight Monday. Trump, facing the first major weather event of his presidency after a mild winter, said that he had spoken to Homeland Security and that the Federal Emergency Management Agency was ready to provide assistance. "Everybody in government is fully prepared and ready," he said. "Let's hope it's not going to be as bad as some people are predicting. Usually it isn't." But de Blasio was not taking any chances, with 16 to 24 inches of snow forecast for the city and accumulation as fast as two to four inches an hour. "High end could be as much as 24 inches, which would therefore put this in the category of one of the biggest snowstorms in recent memory," he said. In 2016 New York experienced the biggest snowstorm in the city's history, with a record 27.3 inches falling in Central Park in 24 hours. 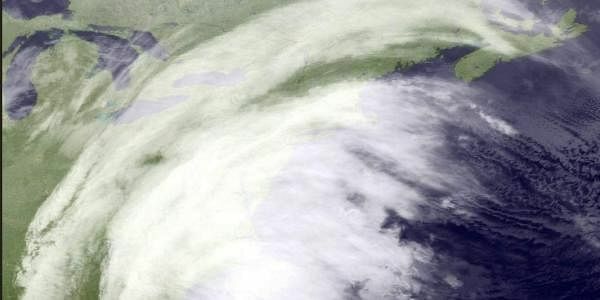 That storm paralyzed parts of the northeast and left 18 people dead. The Metropolitan Museum of Art, one of the city's biggest tourist attractions, said it would close all three of its locations Tuesday. Winter Storm Stella formed near the coast, the collision of two low pressure systems that are expected to dump the heaviest snow on New York, parts of Connecticut, Massachusetts, New Hampshire, Pennsylvania and Vermont. "We're expecting it to be the worst snow of the season," NWS meteorologist Melissa Di Spigna told AFP, following winter temperatures that were "well above normal" this year. The NWS cautioned that the storm could bring record-low temperatures, as well as "difficult travel and power outages." New York Governor Andrew Cuomo instructed residents to have a seven to 10 days' supply of food and plenty of bottled water. In the city, the subway will be suspended above ground and express services will end at midnight, and bus and commuter rail services into Long Island and north of the city are also likely to be suspended. In the US capital, federal workers were allowed to arrive three hours late, while the city's subway system was operating on a weekend schedule.